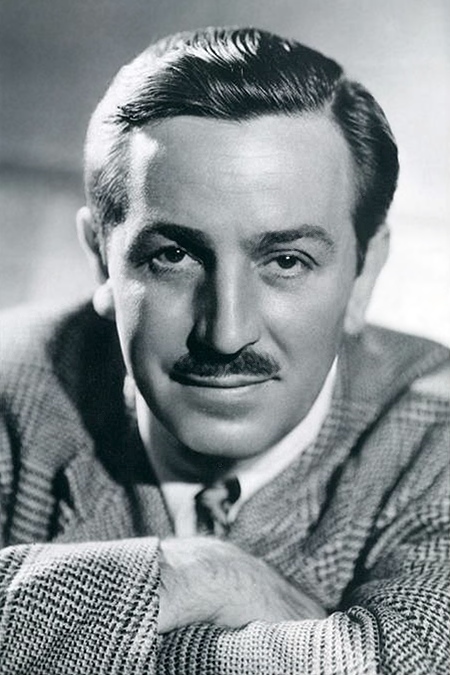 Walter Elias "Walt" Disney (December 5, 1901 – December 15, 1966) was an American film producer, director, screenwriter, voice actor, animator, entrepreneur, entertainer, international icon, and philanthropist, well known for his influence in the field of entertainment during the 20th century. Along with his brother Roy O. Disney, he was co-founder of Walt Disney Productions, which later became one of the best-known motion picture producers in the world. The corporation is now known as The Walt Disney Company and had an annual revenue of approximately US$36 billion in the 2010 financial year. Disney is particularly noted as a film producer and a popular showman, as well as an innovator in animation and theme park design. He and his staff created some of the world's most well-known fictional characters including Mickey Mouse, for whom Disney himself provided the original voice. During his lifetime he received four honorary Academy Awards and won 22 Academy Awards from a total of 59 nominations, including a record four in one year, giving him more awards and nominations than any other individual in history. Disney also won seven Emmy Awards and gave his name to the Disneyland and Walt Disney World Resort theme parks in the U.S., as well as the international resorts Tokyo Disney Resort, Disneyland Paris, and Hong Kong Disneyland. Whatever we accomplish is due to the combined effort. What ever you do, do it well. Do it so well that when people see you do it they will want to come back and see you do it again and they will want to bring others and show them how well you do what you do. The more you like yourself, the less you are like anyone else, which makes you unique. Our greatest national resource is the minds of our children. The past can hurt. But the way I see it, you can either run from it, or learn from it. Laughter is America's most important export. You'll be a poorer person all your life if you don't know some of the great stories and great poems. Get a good idea and stay with it. Dog it, and work at it until it's done right. A lie keeps growing and growing until it's as plain as the nose on your face. A man should never neglect his family for business. Adults are only kids grown up. The difference in winning & losing is most often, not quitting. I never called my work an 'art' It's part of show business, the business of building entertainment. The era we are living in today is a dream of coming true. A good story can take you on a fantastic journey.